The final nine miles of the track to Little Finland generally require 4WD, or at least high clearance, but for owners of regular vehicles the formations can still be reached, by a cross-country hike of 3.5 miles minimum (one-way), or via a longer round-trip of ten miles which also visits several other sandstone outcrops, more varied in color. Besides the eroded rocks this desert land has other, more hidden, attractions like ancient petroglyphs, short slot canyons and a great variety of plant species, and while the hike is not recommended during the summer months, in cooler times of year the trip is relatively straightforward. Route-finding is easy as there are no trees to block the views, and the land has various features to aid in navigation. Although nearly all is cross country, the elevation change is not great and most of the ground is quite firm, so the hike is not too strenuous. Several hiker-made paths in one part of the loop (in the vicinity of the petroglyph panel known as Kohta Circus) suggest that this section is visited relatively often, but the area between here and Little Finland sees very few hikers. Start point for the hike is at the closest approach of Gold Butte Road, 3.5 miles south of the junction at Whitney Pocket, and 3.7 miles before another junction (with Mud Wash Road, the next section of the driving route), beyond which the surface degrades further and a 4WD vehicle is recommended to continue. A suitable parking place is on a flat area on the west side of a bend, beside a 'No ATV' sign at the end of a disused track. This is also a good camp spot, very peaceful once ATV traffic along the road has finished for the evening. Topo map of the route. 21 views along the loop; gallery, slideshow. The hike starts along the old vehicle track, heading along a ridge just west of due south, close to a shallow wash to the west. The track fades away after about two thirds of a mile at the edge of the wash, and the remainder of the route is cross country; the next section is over the drainage, past a small hill and over more flat lands towards the middle of a low, comb-shaped ridge, all the while aiming for a prominent gap in the much higher line of hills further west. The pass through the hills is reached not far beyond, 1.6 miles from the start. 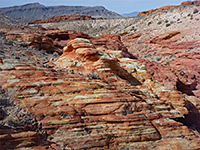 The landscape on the far side looks more interesting, as instead of the dull, rather featureless plains enclosing Gold Butte Road, the desert contains several big sandstone outcrops, colored many shades of red, orange, grey and pink. Around the pass are a good variety of cacti including the rare echinomastus johnsonii, and also plenty of wildflowers. A minor drainage winds down the far side of the hills, crossed at one point by a low fence, and heading generally westwards. From the pass, Little Finland is 1.9 miles southwest, but a big area of slickrock to the northwest provides an interesting diversion; after descending a little, the land flattens out, allowing easy walking over sandy ground, into a little valley and up slightly to the east edge of the sandstone, joining a faint trail that runs north-south. 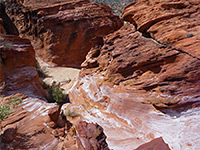 This trail follows the edge of the rocks, curving slightly westwards, past slickrock cliffs and walls, which are eroded into many forms and split by a few shallow slot canyons. There are several difficult-to-find petroglyph panels hereabouts, including the famous Kohta Circus; more are located a mile or so northwards. The rocks exhibit wide color variations, with bands of quite different shades in close proximity, and several hours could be spent exploring. 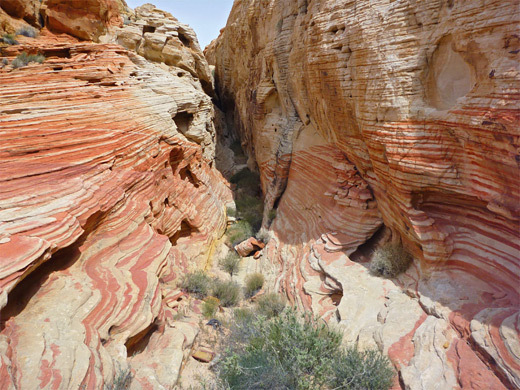 The stripy patterns and rich hues are reminiscent of Buckskin Hollow in southwest Utah. When finished, the route to Little Finland is down the largest ravine through the sandstone, bypassing one dryfall, running beneath quite high cliffs for a little way then emerging back into the open, sandy desert, following a dry wash southwards. After half a mile this cuts through a smaller patch of red sandstone, forming a brief shallow slot and an enclosed pothole (Hartman Tank), followed by a larger rocky area with greater color variation and some nice erosive features. Just beyond is Red Rock Springs - an extended, very shallow water source, not too overgrown, producing at least some moisture all year. A recognisable stream flows most of the time. The drainage is followed for half mile below the springs until it turns west, after which the final section to Little Finland is due south, over soft, sandy terrain crossed by a few more shallow gullies, arriving at the north end of the plateau with the formations in another 0.4 miles. After exploring Little Finland, the quickest route back to the trailhead is to walk northeast, round the tip of a projecting cliff of higher red rocks and into a branched wash, about 30 feet deep. Along the way is a very photogenic, head-shaped sandstone block, quite isolated from any other nearby formations. Following any of several branches of the wash northeast leads to another rocky area not far south of the pass through the high ridge. All around are yet more colorful places including many thin-layered, stripy areas, with bands of deep red and pink. 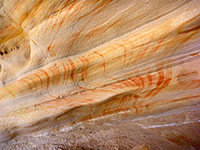 Several parallel, sheer sided ravines cut through the sandstone, and a few sections of the cliffs are marked with faded petroglyphs, etched long ago into the dark red patina. On the far side of the sandstone outcrop, a short, not too steep climb reaches the top of the pass, and the hike is completed by retracing steps down the far side, across to the shallow drainage and along the old vehicle track - a round trip of about ten miles, not counting walking around Little Finland.